Bado's blog: Rayma Suprani fired from "El Universal"
Rayma Suprani fired from "El Universal"
A Venezuelan cartoonist said she was fired from her newspaper for a caricature that used the late socialist leader Hugo Chavez's signature to satirize the state of healthcare. "I was informed of my sacking from El Universal over this caricature and my awkward attitude over graphic satire," veteran cartoonist Rayma Suprani said via Twitter late on Wednesday. 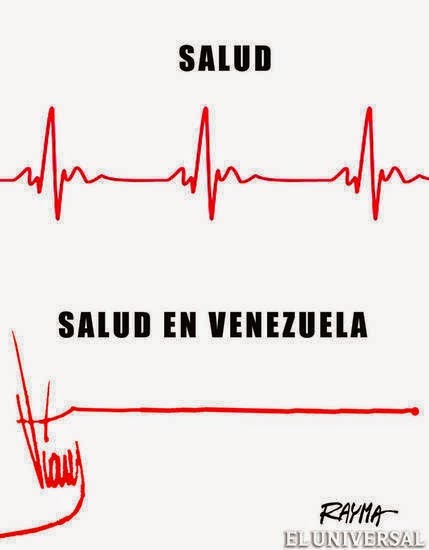 The cartoon, which ran on El Universal's editorial page on September 17, showed a normal-looking electrocardiogram under the heading "health" with another one merging Chavez's signature into a flat-lining heartbeat line under a title "health in Venezuela." The cartoon touched on two hugely sensitive subjects in Venezuela: the legacy of Chavez, the former president who ruled for 14 years before his death from cancer in 2013, and the socialist government's management of the health system. Supporters say Chavez transformed healthcare for the poor via popular programs like "Barrio Adentro" (Inside the Neighborhood) which set up a network of small health clinics staffed by Cuban medics that offered free treatment. Opposition supporters often acknowledge welfare advances under Chavez, but say they were patchy, and are highly critical of shortages of medicine and equipment due to Venezuela's economic crisis. One opposition leader, Henrique Capriles, paid public tribute to Rayma after the caricature affair and used it to take a jab at Chavez's successor, President Nicolas Maduro. "You have masses of talent and the admiration of thousands - just what those in power lack," he said on Twitter. El Universal's traditionally virulent anti-government line has softened under new ownership this year, though critical stories and opinions still appear. "My immediate boss called me and told me he didn't like my caricature and I was out," she told local radio. "We've become a country where if you say things, have your own criteria and try to provoke reflection, it's not well-viewed." Despite the saga, El Universal, one of Venezuela's main dailies, was this week running a national competition to encourage budding new cartoonists. Pat Oliphant Interviewed in "The Atlantic"